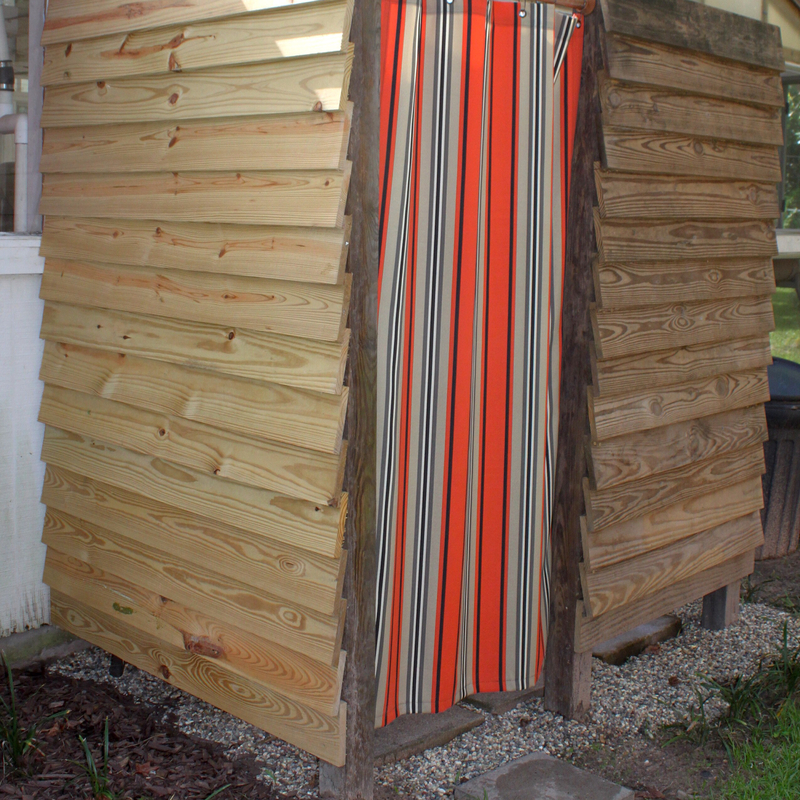 That is right we built an outdoor shower and can I tell you we love it! 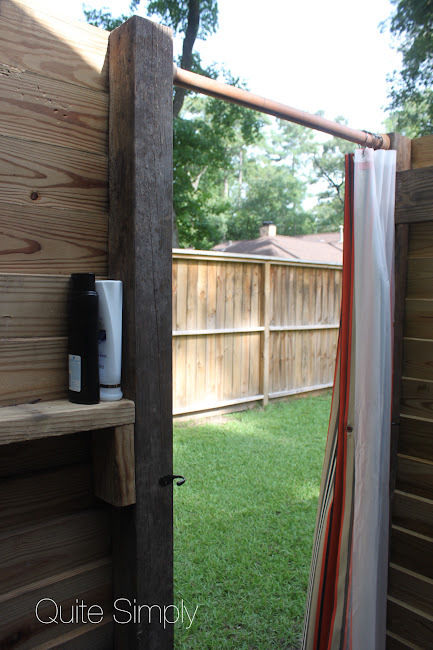 I have wanted an outdoor shower for a long time, but in the midst of the cramped suburbs where the lots are small and there is no privacy it was not an option for obvious reasons. But the second we moved to the "new" house I knew that we could add one, but I thought it would be further down the road. 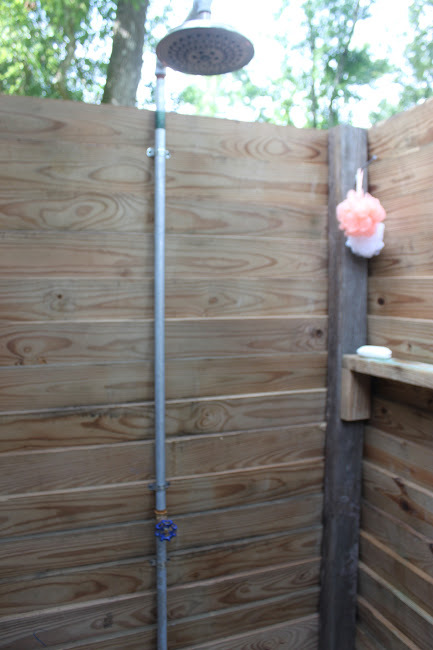 A few weeks ago as we were cleaning up some of the piles of stuff around our yard to make it look better we were separating out what we thought we could reuse for various projects and realized we had quite a bit that we could use for our shower. We had everything we needed except one 4x4 treated post, the 1x6 treated for slats on one side and the plumbing fixtures for the shower. So we just jumped in and started. 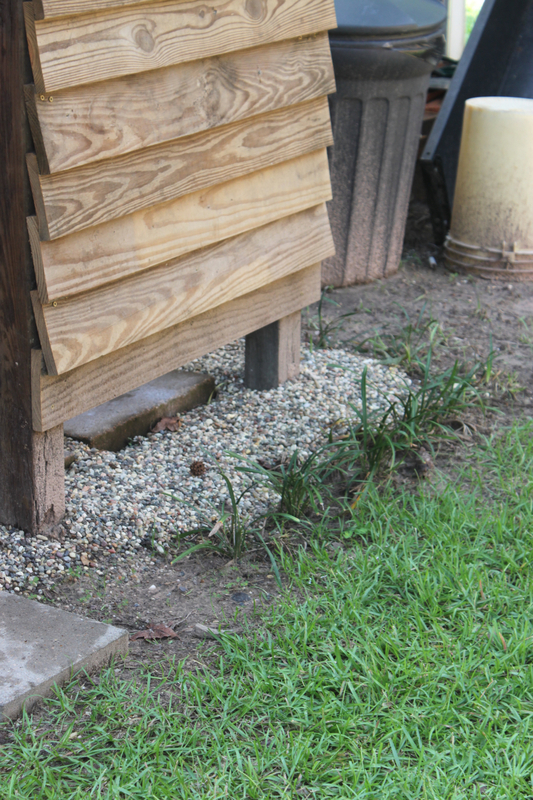 We chose a spot outside the greenhouse for several reasons, one is the privacy as well as the future plans for the greenhouse and the fact that the spigot was convenient. 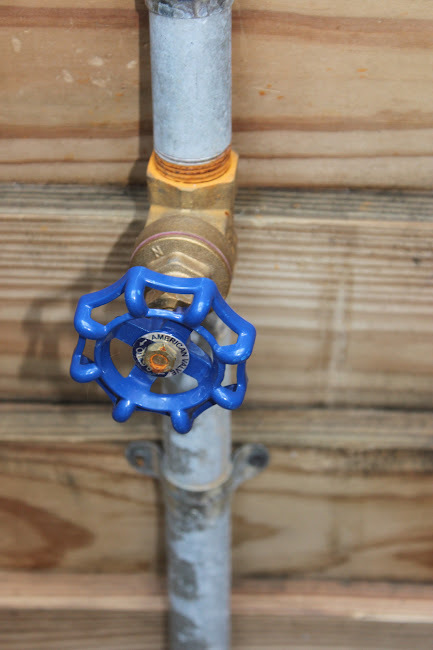 One of the other benefits of our yard, we have spigots all over our yard and have plans of using them for a sprinkler system, but this one was perfect for the shower. After cleaning up the actual site of the shower we put down concrete pavers and then pea gravel around them for a floor. 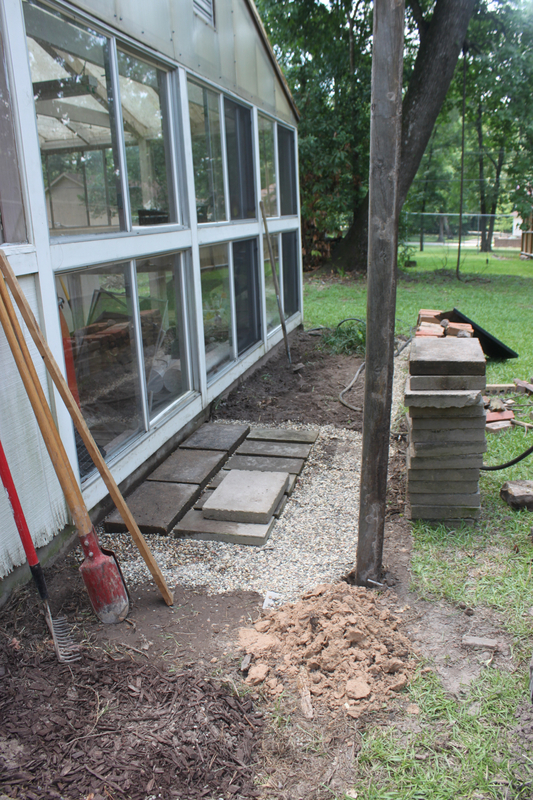 (yes we had all of this) The pavers provide a place to stand and the gravel allows the water to absorb into the ground. 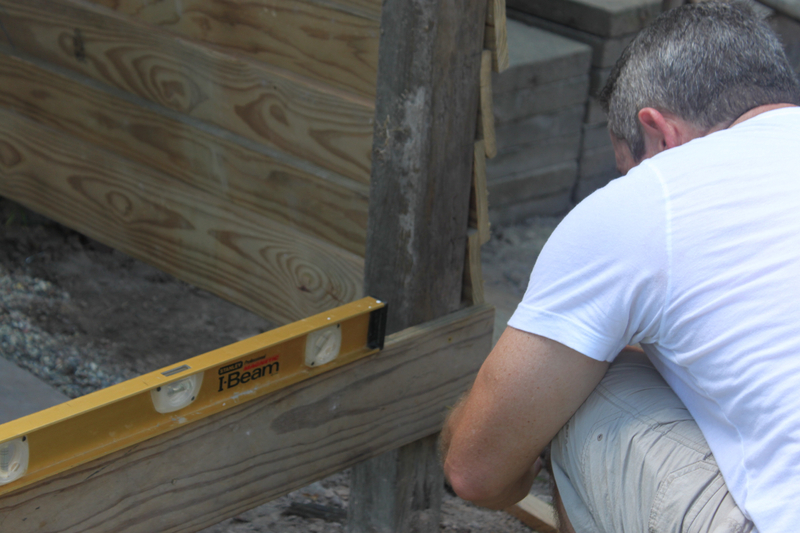 We then dug holes for the three 4x4s as corners of support and set them in concrete. The fourth side is the greenhouse itself. 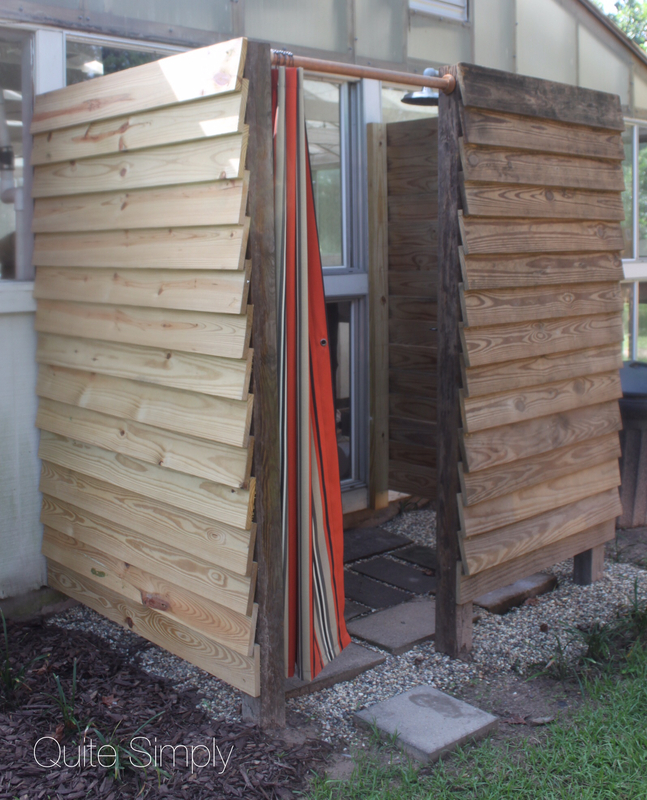 The following weekend we measured the slats for the sides overlapping each by about 3/4 of an inch, thankfully Wonderful is good in the math area! As for the plumbing we referenced Bob Vila and his directions on building the shower. 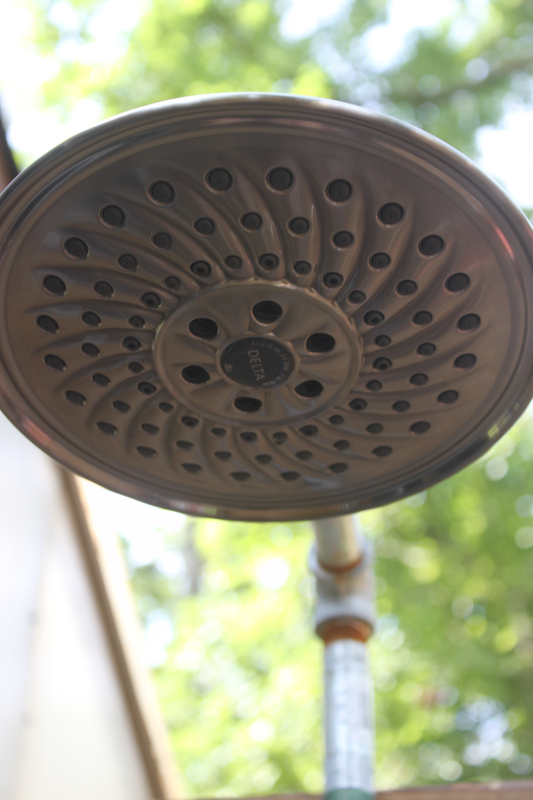 We splurged on the showerhead, opting for the rain head. Everything else is pretty basic stuff. As of right now we only have cold water, and in the summer that is all we need. But we do have the capability to add hot water and may do that when the greenhouse is rennovated. I made a custom fitted shower curtain, and will include directions for that in a later post. In our area of the world, we use this shower all of the time. Wonderful is committed to daily exercise and the shower provides him a great place to wash off when he is finished. I have also talked about the heat and hummidity, so when we do anything outside, yard work, DIY projects, etc we are a sweaty mess! Remember when I was talking about replacing the soffets and I could only see the whites of Wonderful's eyes, yes a trip to the outside shower was in order! It keeps us from tracking a lot of this in our house. 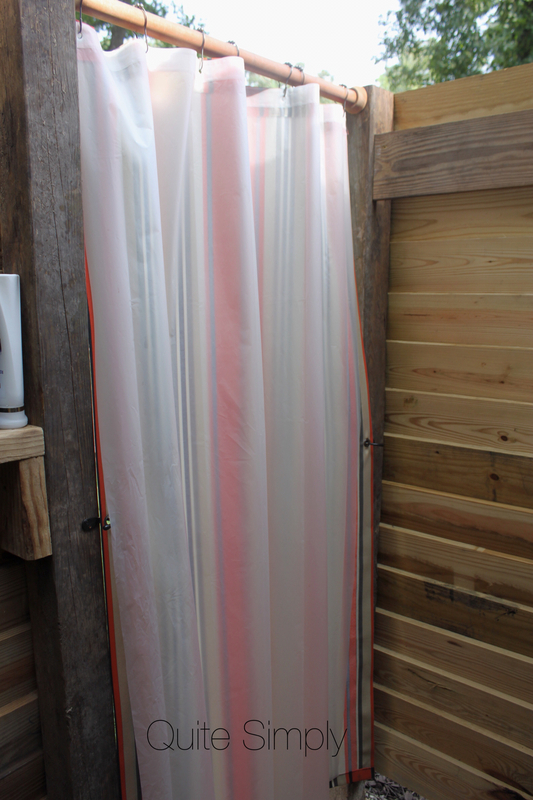 We still have a few things to add, including hooks for towels and such but we love the shower! It is a great project, if you have any questions just let me know! 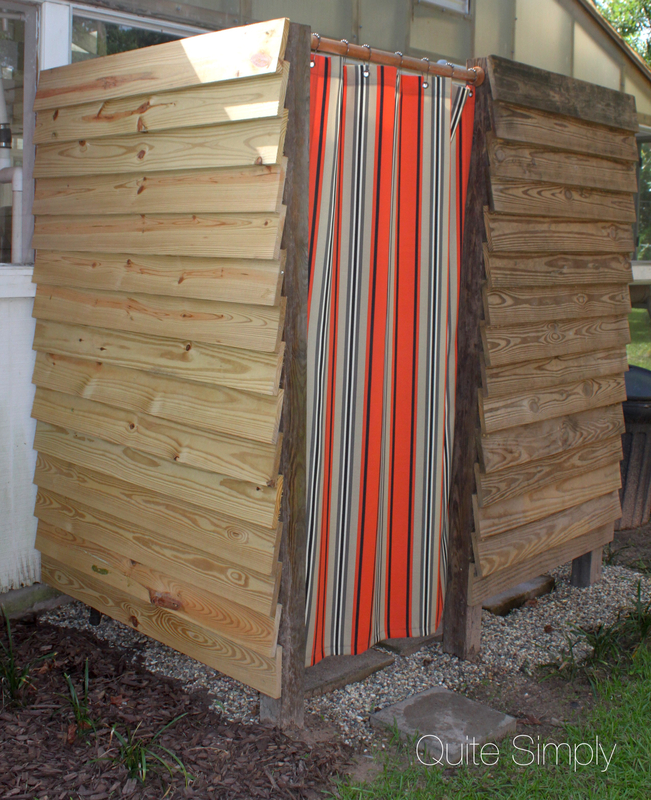 It really is great, we get to wash off the outside sweat and grime and yes it is quite refreshing on hot days! Thanks for visiting. Cool project, though I'm not sure I could use an outdoor shower with an indoor one available. Looks great, and obviously brings you and your family joy! It has been great for us, I guess it might depend on where you live as to how much you would enjoy it. Blessings and thanks for the visit! It has been so practical for us. There are still a few things to tweak. Wonderful says he will use it year around, I am not convenienced! Thank you Andi for stopping by. We are very pleased with how it turned out! Thanks for the visit Marie! Wow! Great job - I wish I had the talent to do something like that!! I am very thankful for my guy! He is willing to tackle anything. Thanks for the visit. This is a fabulous idea! I will be storing it away..Glad to do #OMHGWW with you this week! Thanks Shellie for stopping by, I was just visiting The Fab Journey yesterday. Lisa, I really recommend it! I will certainly stop by Sweet Tea N' Salty Air soon. Have a great day! That is so cool - and something my father would probably enjoy building. He's forever doing something to their house. Right now, he's building a third storey. Melanie, it was a pretty easy project. 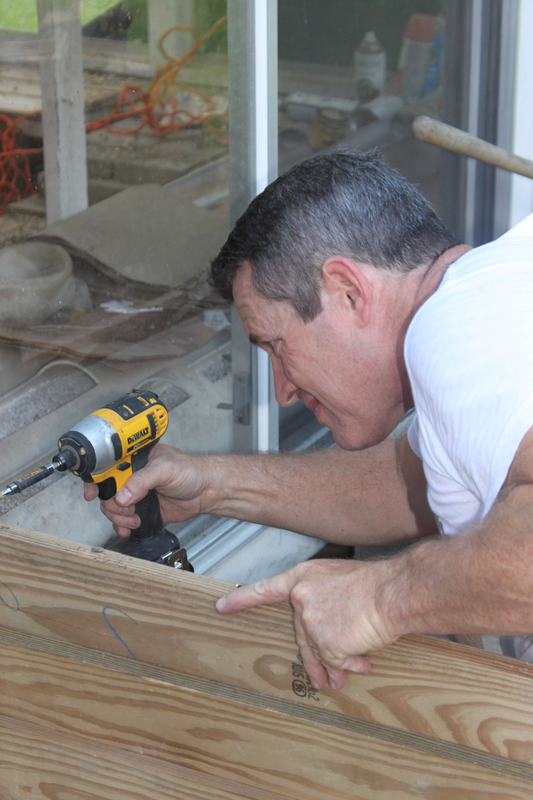 Your dad will need an easy project after building a third floor! WOW. Thanks for checking us out! I LOVE this! Reminds me of my younger days camping lol. Much respect to you all for building it and that shower head looks nice! God bless! Thanks Chari for the visit and the encouragement! Blessings!